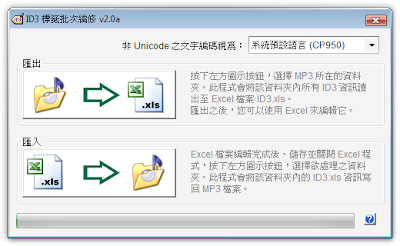 Edit your MP3 information the way you like in Office Excel! "ID3批次編輯工具 - ID3 Batch Editing"
Thanks, you are so nice. Trial run 919 file is ok.
Can't call method "readystate" on an undefined value at /Win32/IEAutomation.pm line 562. I would like to know is there any way to open the file through open office. I don't have Microsoft Excel. "Writing of ID3v2.4is not fully supported)prohibited now via`write_24"
Ok, thanks man, i'm gonna try. Thanks for your program, you did a really great job. I'm not sure if you are still using this blog, I'm trying to edit more than 500 files. I edited "ExcelMaxLine = 500" in the ini file, but it didn't work. How can I edit ini file?